Strategy development follows the creation and affirmation of the organization’s purpose statement, environmental and program data collection and analysis, and identification of critical issues. It is critical that strategy development follow these steps because the information gathered and decisions made in these phases are the foundation for strategy creation and selection. Each of these steps provides the following: The purpose statement, the statement of the organization’s ultimate goal, provides the direction to which the strategies should ultimately lead. External market data and program evaluation results provide critical data to support strategy development. Without this information and insight, the organization’s strategies will not be in alignment with or effective in the marketplace. The critical issues list serves as the specific focus and framework for the activities of the organization and the pattern of these activities. Strategic objectives: Strategic objectives are long-term, continuous strategic areas that help you connect your mission to your vision. Holistic objectives encompass four areas: financial, customer, operational, and people. 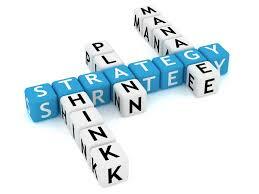 Strategy: Strategy establishes a way to match your organization’s strengths with market opportunities so that your organization comes to mind when your customer has a need. This section explains how you travel to your final destination. Action items: Action items are plans that set specific actions that lead to implementing your goals. They include start and end dates and appointing a person responsible. Scorecard: A scorecard measures and manages your strategic plan. What are the key performance indicators you need to track to monitor whether you’re achieving your mission. Execution: In executing the plan, identify issues that surround who manages and monitors the plan and how the plan is communicated and supported.